Break open the blood casks and prepare to shatter the seals: The prophesied hour of darkness if finally upon us, as TVLine reports that television’s two Sheldons—Young, and Regular-Sized—are finally preparing to meet. The site reports that Iain Armitage—who plays The Sheldon Of Christmas Past on CBS’s Big Bang Theory spin-off Young Sheldon—has now been set to appear on the franchise’s flagship series as it enters its final, now-apocalyptic season. And now that this Crisis On Infinite Sheldons is finally upon us, can the grim visage of Future Sheldon—flanked on each side by his dark army of Bazingoids and nerd-friendly celebrity cameos—be far behind? To be fair, we don’t know what form Armitage’s appearance on the series will take. 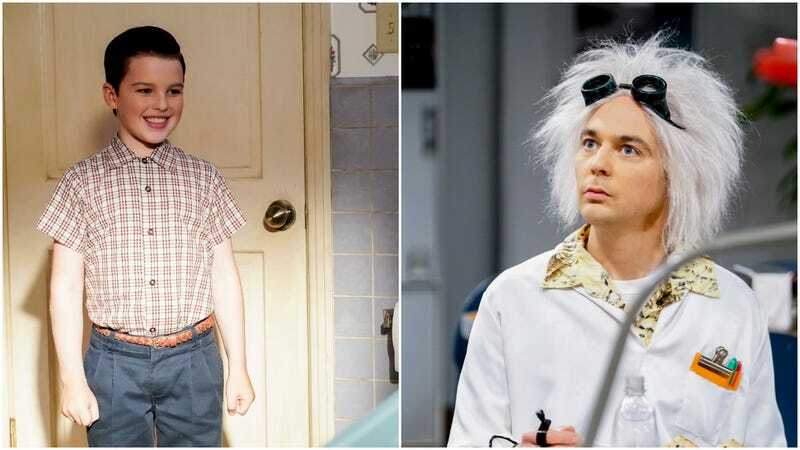 It could be as simple as a fun little flashback, allowing Jim Parsons (who also narrates the spin-off) to wax nostalgic on his marginally more heartwarming childhood. (The additional guest-casting of Armitage’s co-stars, Lance Barber and Montana Jordan, would suggest that that’s probably pretty likely.) But we also don’t trust The Big Bang Theory not to stick Parsons and Armitage in the same room together for some sort of goof, and then we’re only one laugh track-assisted pratfall away from a repeat of what happened to poor Ron Silver at the end of Timecop.